Puck the Media is live in Philadelphia for the Winter Classic Alumni Game, and for the actual Winter Classic on Monday. For more info on the activities, follow me on Twitter @stevelepore. So I’m standing behind home plate at Citizens’ Bank Park Saturday afternoon at around 4:30 p.m. ET. The hockey is dull, as most of the men playing are in their 40’s and 50’s. We’ve still got another period to go in what feels like a low scoring game (2-1 Philadelphia) for a game that doesn’t count. The thing is, despite all of this, I haven’t seen one person without a smile on their face in the crowd of 40,000-plus. And with everything I’ve ever heard about Philly, that seems like a pretty big accomplishment. Even if the hockey isn’t great at the Winter Classic alumni game, the spirit certainly is. The only time the color orange will ever be accepted among the hoards of humanity here at Citizens’ Bank Park (as a Mets fan, this is the time when I remind you that baseball is a cruel, unhappy game) and they showed up in spades. Everyone stood for Mark Howe’s penalty shot goal and a 4-1 Flyer win, and created some of the loudest noise I’ve ever heard at a baseball stadium (again, baseball is sad and cruel). Even if there’s nothing in terms of ratings to gain from yesterday’s Winter Classic Alumni Game, this much is certain: the league got a palpable buzz boost from this year’s game, the second annual event. People were excited just to hear the lineups for this thing. It has officially added a second (if you count practice, third) day to the whole Winter Classic experience. I can’t imagine there’s a way we don’t see this at every Winter Classic from now on. So the question is this: can we go bigger? Here’s my proposal. A reminder before-hand that it is merely a proposal and I don’t know how feasible this is, but here you go. The NHL All-Star Game has long been considered a dud by most standards. Though ratings are up, and the All-Star Fantasy Draft has added some fun to the proceedings, one could argue that fans are tired of the game and that we don’t really need to shut down the league three days a season for a meaningless exhibition. So why not make the day in between the Alumni Game and the Winter Classic a Winter Classic All-Star Night instead? Now, I’m not talking about doing the All-Star Game at the Winter Classic, but here’s the idea: on the night in between the Alumni Game and the Winter Classic, hold the old superskills competition. Invite players from every team (you don’t really need a limit) and hold the skills competition over two hours. Have all of the competitions count for goals between conferences, and hold a period of shinny between the two teams to decide a winner, with both teams donating a substantial amount to charities. While it could just be a shortened version of the All-Star Game, you’d be taking the parts of it that are widely recognized as being fun, and not over-doing it on the game aspect of things. You could even do a small fantasy draft element of it: name captains (possibly from the two Winter Classic teams) and have them pick it old-school, playground style. Put in on under the lights, in primetime, on NBCSN and CBC on the 31st, with the Alumni Game on the 30th, and you have three days of awesome, fun NHL activities, and you only shut down the league officially for games on two of those days. This would also force the NHL to keep expanding the Winter Classic to markets that aren’t necessarily going to get it in the immediate future. The Florida Panthers, Columbus Blue Jackets, Dallas Stars and other sun belt (and let’s face it, Canadian teams) aren’t likely to be involved in this anytime soon. So get at least one player from every team, and give the fans that cool “my guy made it!” feeling from the All-Star Game, and compound it with the Winter Classic. At the end of the day, the two teams, filled with legends who have won Stanley Cups, Hart Trophies and Gold Medals (just to start) gathered at center ice for a photo that I’m sure will be autographed and go to auctions for thousands of dollars. It is a true celebration of this wonderful sport’s past. What if, on the next night, you could have that same photo taken to celebrate it’s present and future? This would make the Winter Classic even more of a tentpole, must-watch event every year. NEW YORK – December 30, 2011 – The 2012 NHL Winter Classic Alumni Game featuring former Philadelphia Flyers against former New York Rangers in a New Year’s Eve showdown on Dec. 31, which was scheduled to air at 1 p.m. ET, will now air live at 3 p.m. ET on VERSUS. The delayed start time decision by the NHL was based on tomorrow’s weather forecast and should make for optimal game conditions for players and fans. The Alumni Game will showcase six members of the Hockey Hall of Fame, recent retirees and Stanley Cup winners, including Mark Messier, Brian Leetch, Eric Lindros and NBC Sports’ Jeremy Roenick. NBC Sports Network guest analyst and former Rangers coach Mike Keenan, who won the Stanley Cup in 1994 while coaching the team, will lead the Rangers alumni team. NBC’s coverage of the 2012 Bridgestone NHL Winter Classic begins at 1 p.m. ET on January 2. Immediately following the game at 4 p.m. ET, the NBC Sports Network (currently VERSUS) will be launched with a special NHL Live post-game show hosted by Bob Costas from Philadelphia. 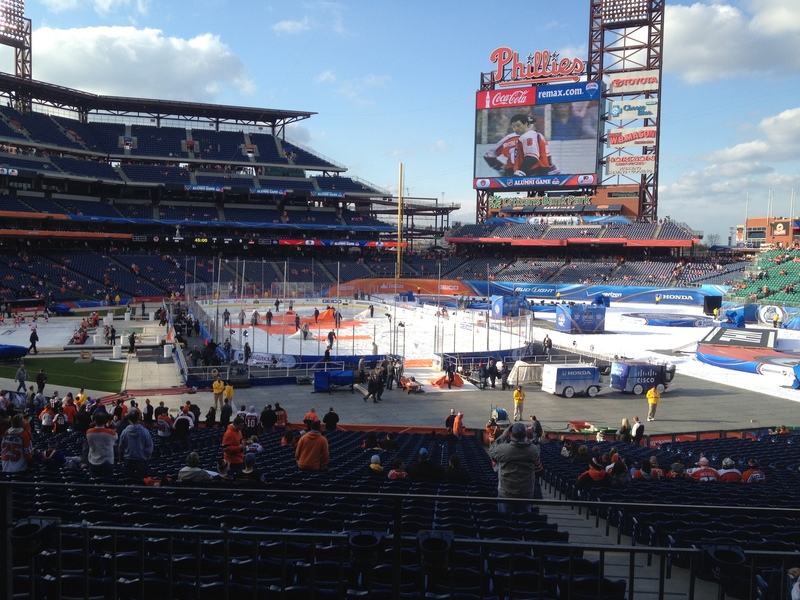 This year’s Winter Classic features an intense rivalry between the top two teams in the Atlantic Division as the Philadelphia Flyers and New York Rangers battle outdoors at Citizen’s Bank Park in Philadelphia, home of the Phillies. This is the fifth iteration of the NHL Winter Classic, an event created by both NBC Sports and the NHL. Toronto, ON (December 30, 2011) – Canadians continue to embrace TSN’s coverage of the 2012 IIHF WORLD JUNIOR CHAMPIONSHIP. According to the latest audience data from BBM Canada, TSN’s coverage of Team Canada’s first three preliminary games have attracted an average audience of 2.3 million viewers. All three games ranked as the most-watched program of the day on Canadian television in all key demographics. Online, TSN.ca registered 133,000 live streams of Team Canada games while TSN’s brand-new TSN Check-In app on Facebook – giving fans the ability to “check in” from around the world and show that they are cheering on Team Canada – has gained more than 27,000 registered users, with fans checking in across Canada and from around the world. TSN’s coverage of the 2012 IIHF WORLD JUNIOR CHAMPIONSHIP continues on New Year’s Eve at 7:30 p.m. ET as Team Canada looks to go 4-0 in the round-robin when they take on Team USA. Live coverage of the game also features Campbell River, BC’s Barry Kazimer, as the retired military veteran heads to the ice during the first intermission for the chance to win $1 million and as many as three all-new Chevrolet Volt electric vehicles in the Chevrolet Volt Million Dollar Shootout. TSN is Canada’s Sports Leader and Canada’s most-watched specialty network. Delivering more sports coverage in High Definition than any other network in Canada, TSN’s comprehensive broadcast schedule features an exciting lineup of sports including NHL, CFL, NFL, NBA, MLS, the IIHF World Junior Championship, Season of Champions Curling, Golf’s Majors, F1, NASCAR Sprint Cup and Nationwide Series, Grand Slam Tennis, EURO 2012 and 2016, the Tour de France, NCAA March Madness tournament and Championship Boxing events. TSN properties include TSN2, TSN MOBILE and the industry-leading sports website TSN.ca. Official broadcaster of the London 2012 Olympic Games, TSN is a division of Bell Media, which is owned by BCE Inc. (TSX, NYSE: BCE), Canada’s largest communications company. Michael Hiestand has a piece on the new NBC Sports Network today. It’s worth reading, despite his clear lack of knowledge about the Summit Series (I know, Hiestand dumb on hockey? Stunner) there’s some good information. The network will be getting an NFL pre-game show at 10 a.m. on Sundays at some point. Among the various notes included is that NBC Sports Talk, the network’s nightly 6 p.m. ET show, will be expanding with an 11 p.m. ET version sometime next year. Who knows if there’ll be differences, but if the 11 p.m. show is anything like the 6 p.m. show, I’ll be fine tuning into it after hockey every night. I haven’t really said anything about the show, because it takes time for them to develop, but after three months or so on the air (the show premiered on NFL opening night), I feel safe in commenting on the groove the show’s gotten into. NBC Sports Talk may not break any new ground, but it provides an interesting, refreshingly low-key take on sports chat. What, in my opinion, separates the show from others is it’s lack of ego. Russ Thaler, a Comcast Sportsnet ex-pat, is a rare treat in sports broadcasting: a completely ego-free, but still high energy host. He manages to churn something good out of the varied guests (from former NFL players Trevor Pryce and Amani Toomer to the network’s bevy of NHL analysts) without letting it go off the rails or let the analysts take over. It feels like an actual conversation about sports is taking place. The show isn’t big on highlights, so it’ll be worth seeing what an 11 p.m. show would include in terms of that. But they do pack the show with guests and coverage of big events. The network’s team from the MLB GM meetings, featuring Craig Calcaterra and Rob Neyer, was surprisingly good (it’d be nice if they’d done something similar from the NHL owners and GM meetings, since they have the rights and all). The cast of regular guests, including Calcaterra, Spencer Hall, Mike Halford and Jason Brough, and Adrian Wojnarowski, consistently bring something to the table, but it’s Thaler’s ability to converse in the lingo of pretty much any sport (there was a legitimate discussion of soccer around MLS Cup time even!) that ties it all together. The show’s focus on the NFL can be a little overbearing at times, even on the non-designated football days Monday and Friday. But overall, Sports Talk takes a balanced look at sports every night, and jam packs the thing with guests. I know I occasionally post the ratings for the show sometimes, and they’re not blowing anything out of the water, but give it a shot. Help out the NBC folks and help out hockey. Turn on NBCSN at 6 p.m. and don’t leave until Roenick’s breathed his last breath on Overtime, and see if it changes your sports routine at all. I’m glad the show is hear to stay, it appears. Some of this you haven’t seen, some of this you haven’t seen the boring surrounding ratings behind. All of it from The Voice of TV. Enjoy. *- NBC Sports Talk aired at 7:00 and 8:00. *-NFL Turning Point aired at 10:20 and 11:20. Editor’s Note: I really don’t know much about college hockey. Or junior hockey, for that matter. I get into the Frozen Four and World Juniors, but that’s the limit. But the NCAA game takes a big step forward tonight, aligning itself with the same television network as the NHL (VERSUS/NBCSN) for a 16-game package that includes the Hockey East semi-finals and finals. So, to catch a Puck the Media reader up on what they’ll be watching, I enlisted the affable and talented Chris Peters, of the solid United States of Hockey site. Enjoy. When NBC announced that it would carry a number of college hockey games on VERSUS/NBC Sports Network, the enthusiasm felt by college hockey fans nationwide was palpable. With regular-season college hockey on basic cable and on the network that carries NHL broadcasts, the NCAA game has been granted unprecedented exposure and a chance to reach a wider audience. Previously, college games were only available on premium channels like Fox College Sports, CBS College Sports and ESPNU, which are often part of extended sports packages and therefore not available to the vast public. So here I am on Puck The Media to give you an idea what college hockey is all about and also to give you a glimpse in what you can expect out of the VERSUS/NBC Sports Network coverage of NCAA Division I college hockey. Just to catch you up on the general stuff, college hockey features many drafted prospects and a host of players that will sign with NHL teams as undrafted free agents. Players like Jake Gardiner (Wisconsin), Stephane DaCosta (Merrimack) and Craig Smith (Wisconsin), currently in the NHL, were playing on college teams just last season. So the level of hockey you’ll see is pretty good. College hockey also offers some of the best in-game experiences like pep bands, rowdy student sections and really unique facilities. NBC Sports Network will be visiting a whole bunch of different college arenas as part of its 16-game broadcast schedule for NCAA hockey. On New Year’s Eve, hockey fans will get a really outstanding matchup on the inaugural college hockey broadcast on VERSUS. No. 6 Notre Dame will take on No. 9 Boston University in a battle of a pair of teams that have been among the NCAA’s elite for the last several years. However, both teams’ lineups are slightly depleted for various reasons. Notre Dame is without leading scorer T.J. Tynan and top-four defenseman Stephen Johns, currently playing with Team USA at the World Junior Championship. Boston University also has defenseman Adam Clendening skating with the U.S. However the Terriers also suffered two losses that were both high profile and permanent. Corey Trivino, the team’s leading scorer is in a mess of serious legal trouble and was dismissed from the team just a few weeks ago. Shortly after, Charlie Coyle, a first-round draft choice and currently skating with the U.S. at the World Junior Championship, announced that he’d be leaving BU for the Quebec Major Junior Hockey League. So that’s two of the Terriers’ best players that are gone. While both teams have depleted rosters, there are still plenty of reasons to watch the New Year’s Eve tilt between a pair of college hockey’s elites. Notre Dame’s new building, the Compton Family Ice Arena opened just a few months ago and has become one of the premier facilities in the NCAA. Both teams have two of the best coaches in college hockey in BU’s Jack Parker and Notre Dame’s Jeff Jackson. A total of 17 players drafted into the National Hockey League will play in the game, not including the players currently at the World Juniors. Among the draft picks playing on New Year’s Eve, Notre Dame’s Riley Sheahan, who was a first-round pick of the Detroit Red Wings in 2010. These are two hockey teams that are going to make a legitimate push in the postseason and should provide some very exciting hockey. Both have great speed and skill up and down the lineup, even with some of the best players missing. As for the rest of the NBC Sports Network’s schedule, there’s a wide variety of games that will be on display, as every Division I conference, but one, will have games on the network. The defending champion UMD Bulldogs are again atop the national rankings. Since an early-season sweep at the hands of rival Minnesota, the Bulldogs have been rolling. In fact, they haven’t lost a game since and now boast a 10-2-2 (yes, there are ties in college hockey) record. UMD features one of the best players in college hockey in Jack Connolly, the nation’s leading scorer. Nebraska-Omaha will offer a good test for the Bulldogs, but UMD is the one with the chance to show the nation why it’s number one. It’s a down year for the Wolverines, who are currently unranked, but rankings hardly matter in a rivalry game. Michigan and Notre Dame have played some classics over the years, even when Notre Dame wasn’t exactly a national power. It’s two of the biggest name schools in college hockey and it should be good entertainment, for what will likely be the best chance for NBC Sports Network to bring in some decent ratings. Well, it’s Yale at Harvard. So there’s the draw. Yale has been one of the best teams in the ECAC for the last few years, while Harvard has been experiencing some adversity in the standings. Either way, it’s two of college athletics’ oldest rivals going head to head in front of a national audience. If only for the tradition, this one’s worth taking in. The University of Minnesota Golden Gophers are back in a big way after a few down years, thanks in large part to losing players to pro hockey. Currently at No. 2 in the country, the Gophers have some of college hockey’s best players, especially Florida Panthers first-rounder Nick Bjugstad. Denver is no slouch either, currently ranked No. 15 in the country. There is a litany of pro prospects on the Pioneer’s roster and they should challenge in the post season. This game is the second half of a double-header on Feb. 10, and is definitely the headlining act. This has the potential to be NBC Sports Network’s most entertaining game. We won’t know who the final two teams will be in the Hockey East championship, but anytime you have a conference title on the line, you can expect a spirited battle. No matter who plays in this final, it’s going to be a good game and there’s likely to be a lot of pro prospects hitting the ice. College hockey is an exciting brand of the game. If you’re an NHL fan that’s never experienced college hockey, this is a great opportunity to do so. Any of the 16 televised contests on VERSUS/NBC Sports Network will offer some form of entertainment. Hey, it’s more hockey on TV, so who on earth would complain about that? Oh, right. No one.